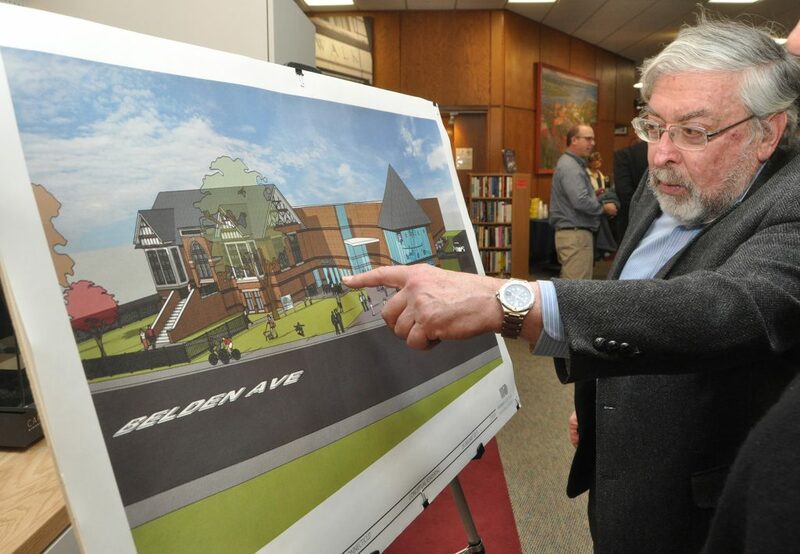 Norwalk Public Library Board of Trustees Chairman Alex Knopp explains a rendering of a potential library option, Monday in the Norwalk Public Library. To learn more, watch a video by Harold Cobin, below. 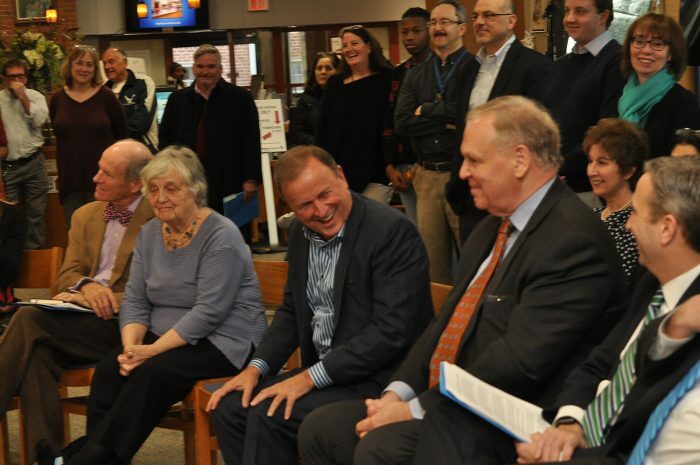 Connecticut Public, the parent company of Connecticut Public Television (CPTV) and Connecticut Public Radio (WNPR), is partnering with the City to create a joint Library and Media Center at NPL’s Belden Avenue facility. 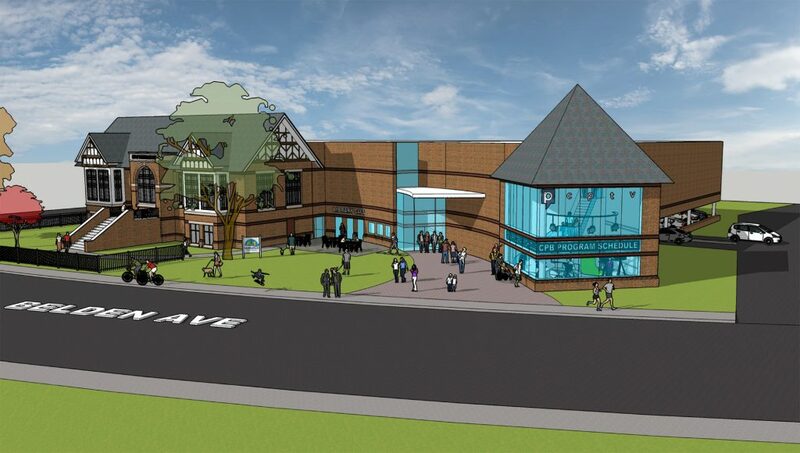 “While the planning process is just beginning, we are envisioning a highly engaging media center, located within the expanded Norwalk Public Library, which would include a broadcast studio, offices for reporters and producers, and a digital classroom space to host Norwalk High School students, adult learners, and veterans,” Connecticut Public said in a statement. The partnership will soon provide a temporary home for the CP-TV studio that Norwalk High School needs for its Digital Media and Communications Academy, without any new construction. Norwalk officials joined Connecticut Public leaders Monday for a press conference, to unveil the partnership. “When this opens, this will be the game changer for downtown Norwalk,” State Senate Majority Leader Bob Duff (D-25) said. In July Connecticut Public received a $1.5 million state grant to create a Wall Street-area Innovation and Tech Education Center. The opportunity arose unexpectedly four months ago, Knopp and Mayor Harry Rilling said. Plans for the media center dovetail with City’s purchase of a six-year option to buy 11 Belden Avenue for the library’s possible expansion. The six-year option, purchased for $460,000 from real estate broker Jason Milligan, allowed the library to expand its parking lot. Then the Mayor’s Office guided discussions between the late former Mayor Frank Zullo, then-First Taxing District Commission Chairman, and the library, Knopp said. In 2017, Rilling mentioned the possibility of working with the First Taxing District. “We can work with the First Taxing District and look at their property where make this a compound of sorts, where we can modernize, maybe bring in other developers to work with us, put in mixed use, have a coffee shop, a Starbucks or something like that, and still have plenty of parking to serve the people that come to the library for years to come,” Rilling said at the time. Norwalk Public Schools had anticipated a CP-TV studio in the Fairfield County Bank building for its Norwalk High School media pathway but that fell through. Norwalk Superintendent of Schools Steven Adamowski said Monday that the studio and access to media professionals are needed for the pathway’s capstone project, part of the expansion to a 26-credit requirement for graduation. “Connecticut Public serves nearly one million citizens each month through radio and TV programming, as well as through many digital and online platforms,” according to a statement from the nonprofit. “Connecticut Public is home to Connecticut Public Television (CPTV), Connecticut Public Radio (WNPR), and Connecticut Public Learning, which offers direct service education to teens, adults and veterans in digital media and provides educational programming on television, radio and online. CPTV President Jerry Franklin touts the planned partnership, Monday in the Norwalk Public Library. “Libraries are having a moment,” Norwalk Public Library Director Christine Bradley said, explaining that 640,000 people came into Norwalk’s libraries last year and there were 425,000 “virtual visitors” to the library website. A rendering of one of the options to expand the Norwalk Public Library. Wouldn’t handing out modern computers to school students whose families are unable to provide same also be a suitable use of public funds. Especially when the world’s libraries are increasingly available on the World Wide Web ? And libraries futures are increasingly questioned ? NON, Thankyou for this article. An interesting proposal well worth examining! Sounds like a great opportunity! Let’s include additional citizens in the planning process soon and consider raising additional funds through private sector…family foundations, corporations, etc. Yes, thanks for posting. Really interesting- real collaboration to develop/preserve our wonderful Library as a next-gen, unique community/regional resource – and support CP too – love it!! Agree this would be a magnet for philanthropic funding. 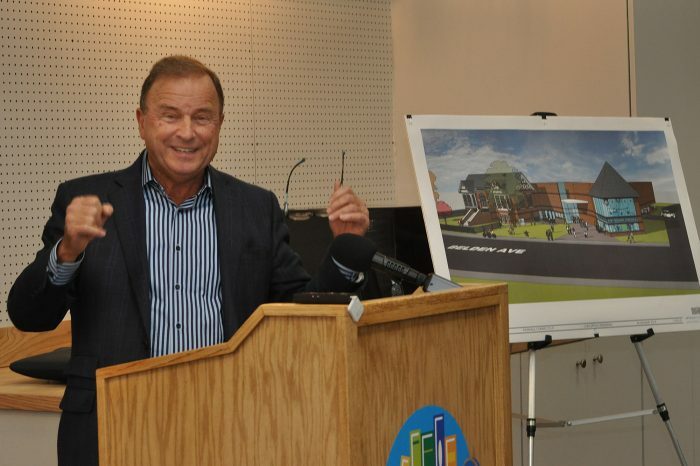 Such great news, and what an amazing opportunity for Norwalk!